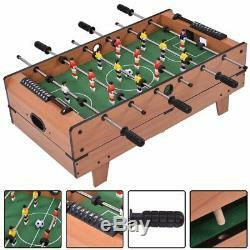 Giantex Multi Game Table Pool Air Hockey Foosball Table Tennis Billiard Game 4 1. Our main goal is an excelent servise. We are doing our best to make our buyers happy and satisfied with their orders. 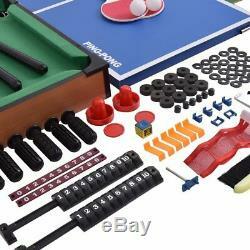 Feature Includes All Necessary Components Cue Sticks, Pucks, Game Balls And More! Rotating Game Table With 4 Different Surfaces Pool, Air Hockey, Table Tennis, Flick Football Pool Table Used As Base As Well Turn The Table Tennis Board Over, And It Becomes Air Hockey Board. 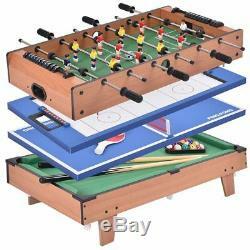 Place Flick Football On Top Of Pool Table Fun For All Age Specification Assembled Dimensions: 32" X 17 X 9.4" (LxWxH) Weight: 31lbs POOL: Dimensions (LxWxH): 30" X 18.7" X 7.5" Cue Stick Length: 26.5" Flick Football (Table Soccer): Dimension(LxWxH): 27"X16"X5.5" Air Hockey: Board Dimensions (LxWxH): 32"X 17" X 1" Table Tennis (Ping Pong) Board Dimensions (LxWxH): 32"X 17" X 1 Package Contents: 1 X Pool Table 2 X Cue Sticks 18 X Billiard Balls 1 X Pool Table Brush 1 X Tri-Angle 1 X Cue Stick Chalk 1 X Flick Football Table 6 X Flick Football Bars 2x Scoring Device 14 X Players 2 X Footballs 1 X Air Hockey / Table Tennis Board 2 X Strikers 2 X Pucks 2 X Table Tennis Rackets 2 X Table Tennis Ball 1 X Net 1 X Allen Key 1x Instruction - &###x1F4B8;ãGiantex 4 in 1 Multi Game Tableã: Rotating game table with 4 different surfaces, can be used as hockey, billiards, table tennis, or football table. 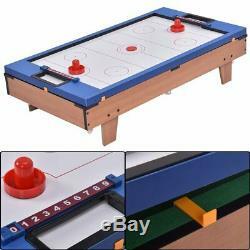 Ideal for any gathering, this 4-in-1 table brings the action and excitement of air powered hockey, billiard, table tennis, and football to your home, everybody will want to play. &###x1F4B8;ãDurable Structureã: Constructed of high quality, non-toxic material, sturdy and reliable, can serve you for a long time. In addition, 4 leg construction provides additional stability. &###x1F4B8;ãFun For All Ageã: Kids and adults will be able to get lots of enjoyment from this versatile and simple-to-use interactive furniture. 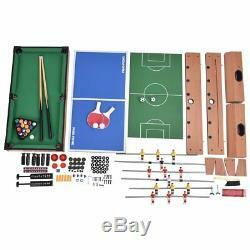 It will fit in nicely in a game room, garage or playroom to give you a unique entertainment option. 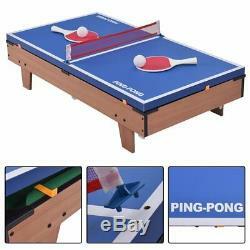 &###x1F4B8;ã4 in 1 Designã: Pool table used as base as well turn the table tennis board over, and it becomes air hockey board. Place flick football on top of pool table. &###x1F4B8;ãDimensionsã: Assembled Dimensions: 32" X 17 X 9.4" (LxWxH), Pool Dimensions (LxWxH): 30" X 18.7" X 7.5" , Foosball Dimension(LxWxH): 27"X16"X5.5" , Air Hockey Board Dimensions (LxWxH): 32"X 17" X 1" , Table Tennis Board Dimensions (LxWxH): 32"X 17" X 1". We do not accept P.
BOXES - PLEASE PROVIDE A PHYSICAL ADDRESS. &###xA0;We advise you to use a reputable carrier service when returning your goods. The item "Giantex Multi Game Table Pool Air Hockey Foosball Table Tennis Billiard Game 4 1" is in sale since Thursday, March 8, 2018. 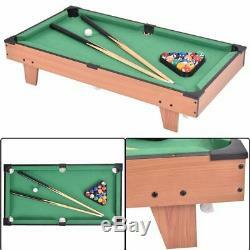 This item is in the category "Sporting Goods\Indoor Games\Billiards\Tables".berta2" and is located in US.